Map showing the tiny variations in the cosmic microwave background (CMB) observed by the European Space Agency's Planck satellite. Paul Sutter is an astrophysicist at The Ohio State University and the chief scientist at COSI Science Center. Sutter is also host of Ask a Spaceman, We Don't Planet and COSI Science Now. Sutter contributed this article to Space.com's Expert Voices: Op-Ed & Insights. The Earth is mediocre, but not in the way you might think (the food is too bland, pop music is soulless, architecture is boring, etc.). In the cosmological sense, the Earth does not enjoy a special vantage point in the universe. There's simply nothing special about our particular location. This "principle of mediocrity" (also sometimes dubbed the Copernican Principle in an effort to salvage our ego) is baked right into the very mathematics that cosmologists use to understand and model the universe: general relativity. The equations of GR are…complex, to say the least, so to make any headway at all physicists must make some simplifying assumptions. When it comes to cosmology, two assumptions make the difference between a world of math-pain and math-paradise: that our universe is homogenous and isotropic. Homogenous means that, at big enough scales, one patch of the universe is roughly like any other patch. Obviously you have to go to beefy enough scales to make this work (for example, the Earth is very different than the sun), and for our universe that happens at around 200 million light-years. Isotropic means that the cosmos looks pretty much the same no matter what direction you look in — again, over sufficiently large distances. With these two assumptions in place, the math of GR is slightly less torturous and progress (i.e., generating testable hypotheses and confirming/refuting them with experiment) can be made. But being good little scientists, not only do astronomers test their hypotheses, they also test their assumptions. Is the universe really homogenous and isotropic? The cosmic microwave background (CMB) is a relic of the very early universe. Released when the cosmos was barely 300,000 years old, that light has been traveling the great expanses of our universe for 13.8 billion years — until it collided with our telescopes. That light surrounds us on all sides, giving us an unprecedented look at the state of the infant universe, equivalent to a picture of you when you were a mere handful of hours old. What a wonderful testbed for our cosmological assumptions. We can ask, "Is the universe isotropic?" to the CMB, and it can answer. The response: Yes! The CMB is perfectly uniform all across the sky to one part in 10,000. Mission accomplished. There are subtle, tiny differences in the temperature of the CMB light from place to place. Those minuscule variations offer a wealth of information on many pressing cosmological questions, like the geometry of the universe, the amount of dark matter and the growth of the largest structures. 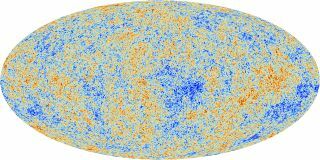 To mathematically quantify the statistical properties of the CMB's characteristic bumps and wiggles, cosmologists turn to a technique called multipole expansion. This expansion looks at ever-smaller patches of the sky and analyzes the variations at only that scale. The first scale is the average CMB temperature across the whole sky — the monopole. The second is the dipole, or two hemispheres. The next is a quadrupole (the sky cut into quadrants). Then octupole (eigths), hexadecapole (sixteenths), dotriacontapole (thirty-seconds) and so on all the way up to…. Well, we kinda run out of names, so just go with 4,000-pole. The total CMB signal is the sum of all these contributions at various sizes, and in an isotropic universe these should all have random orientations. The dipole's hot patch may be over here, but the octupole should be directed over there, with no connection between them. And it turns out there are! From the 2-pole to the 4,000-pole, the European Space Agency's Planck mission (which observed the CMB from 2009 to 2013) verified that all the multipoles point in all sorts of random directions. Except for the quadrupole and octupole, which are just a few degrees away from each other. This coincidence was first noted by NASA's early WMAP mission, but many dismissed it as a statistical fluke that would surely go away with better measurements. It didn't go away with better measurements. And it gets worse. It seems that the CMB is slightly cooler when viewed through the "top half" of our solar system, and slightly warmer on the opposite side. I'm not talking much; just a handful of microKelvin difference, but it's measurable and definitely there. Plus, this peculiar relationship to our solar system is aligned with the quadrupole and octupole. That's odd. It's one thing for two of the multipoles to be aligned — maybe that's just random coincidence — but it's another for them to be associated with our solar system. Hence the nickname "Axis of Evil," a tongue-in-cheek reference to President George W. Bush's labeling of Iran, Iraq, and North Korea in 2002. What's going on? The CMB shouldn't give two photons about our solar system — it was generated before the sun was a twinkle in the Milky Way's eye. And we can't find any simple astrophysical explanation, like a random cloud of dust in our southern end, that might interfere with the pristine cosmological signal in this odd way. Is it really just coincidence? A chance alignment that we're conditioned to find because of our pattern-loving brains? Or does it seductively point the way to new and revolutionary physics? Or maybe we just screwed something up with the measurements? At this early stage, it's tough to say. There aren't a lot of data, and it's easy to get excited. We'll just have to wait and see; eventually the universe will….wait for it…point us in the right direction. Learn more by listening to the episode "The Axis of Evil" on the Ask A Spaceman podcast, available on iTunes and on the web at http://www.askaspaceman.com. Thanks to @Censored_No_More, Peter B., Hayward Z. for the questions that led to this piece! Ask your own question on Twitter using #AskASpaceman or by following Paul @PaulMattSutter and facebook.com/PaulMattSutter.